Illinois was admitted to the Federal Union as the twenty-first state on December 3, 1818. Since that historic date, Illinois has been governed from three different cities and from six Capitol buildings, one leased and the rest state-owned. 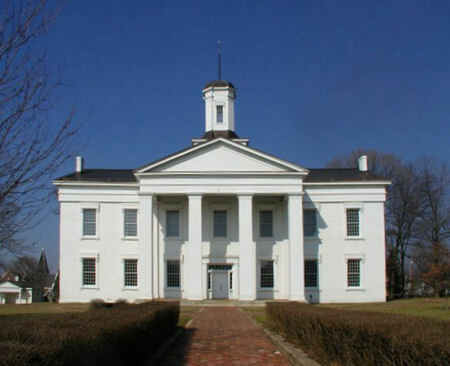 Kaskaskia, which had served as the Territorial seat of government since 1809, became the first Illinois State Capital. Founded in 1703 by French Jesuits, this city had long played a prominent role in the history of the Illinois country and was one of the most important settlements in the Territory. On July 4, 1778 George Rogers Clark and his "Kentucky Long Knives" captured Kaskaskia from the British and Illinois subsequently became a county of Virginia. Clark's important engagements in Illinois during the American Revolution secured the entire Northwest Territory for the newly-created United States. The "Liberty Bell of the West", pictured here, was rung by the residents of Kaskaskia in celebration of Clark's liberation of the town from the British. The bell was a gift from King Louis XV of France to the Catholic Church of the Illinois Country. The bell was cast in 1741 and arrived in Kaskaskia via New Orleans and the Mississippi River in 1743. 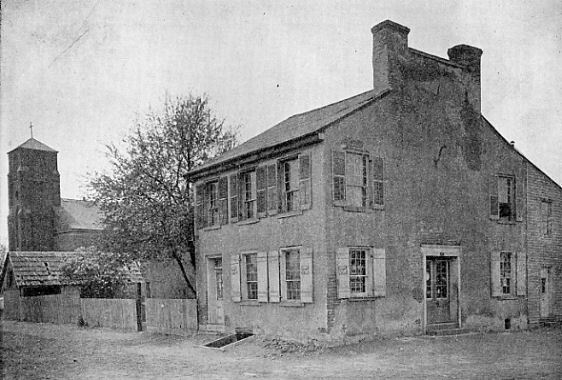 The first Capitol, a two-story brick building, was rented by the new State government at a rate of $4.00 a day. The House of Representatives, consisting of twenty-nine legislators, occupied the entire first floor while the State's fourteen Senators met in the chamber directly above. The First General Assembly petitioned Congress for a grant of land somewhere in the State's interior to serve as the site of a new Capital. After the request was granted, a committee of five selected a site located some eighty miles northeast of Kaskaskia along the Kaskaskia River. This site, then known as Reeve's Bluff, became the city of Vandalia, our second Capital city. The removal of the Capital to Vandalia had been brought about by land speculators, including some of the State's most prominent men, who felt that they could profit by instigating land booms in the unsettled areas. After Vandalia became the Capital in 1820, Kaskaskia declined in importance and gradually disappeared under the waters of the Mississippi River. In 1881, a sudden change in the course of the Mississippi washed away much of the ancient Illinois Capital and created Kaskaskia Island. Succeeding spring floods have further eroded the site until only a small farm community exists today on the remaining portion of the site, the only existing trace of the once flourishing State Capital. The picture to the right shows the first Statehouse in 1899, two years before it was completely swallowed by the Mississippi River. A plain, two-story frame structure was built in Vandalia to house the State government. The lower floor consisted of a single room for the House of Representatives. The second floor was divided into two rooms, the larger reserved for the Senate and the smaller one used for the meetings of the Council of Revision. The Secretary of State, Auditor and Treasurer maintained rented offices separate from the main Capitol building. 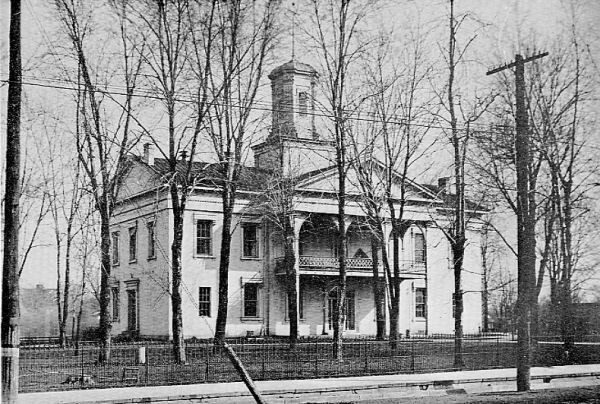 The Second General Assembly first met in the newly-built Capitol on December 4, 1820, During this first sitting an act was passed making Vandalia the seat of government for the next twenty years. After fire destroyed the first state-owned Capitol, a second building was erected in the summer of 1824 at a cost of $15,000. Soon after, a movement began pushing for the removal of the Capital to some site nearer the geographical center of the State. Responding to this growing sentiment, the General Assembly passed an act in 1833 enabling voters to decide the location of the new Capital city at the next general election. The Representative from Sangamon County, a young lawyer named Abraham Lincoln, introduced a bill calling for the transferal of the Capital to Springfield. His bill was actively supported by eight legislative colleagues, and together they were known as the "Long Nine" because their aggregate height was fifty-four feet. Vandalia residents, alarmed at the mood of the Assembly, were determined to retain the Capital. During the Legislature’s recess in the summer of 1836, they tore down the twelve-year-old Capitol building and replaced it with a brick State House costing $16,000. However, this extravagant gesture proved to be entirely in vain. Upon the return of the General Assembly, ignoring Vandalia's efforts, Lincoln succeeded in having Springfield named as the third Illinois Capital. On February 25, 1837, the Assembly authorized the Capital's removal from Vandalia to some place nearer the State's geographical center. Three days later Springfield was the site chosen. Because of the 1820 Assembly Act, Vandalia was to legally continue as the Capital until December 1, 1840. However, Governor Thomas Carlin issued a proclamation ordering the removal of all State records to Springfield by July 4, 1839. 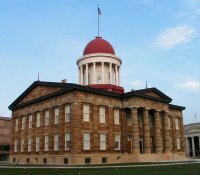 The State government began functioning in Springfield during December, 1839. The Eleventh General Assembly returned the Vandalia Capitol to Fayette County. In 1919, the State repurchased the building and in 1933 to converted it into a State memorial. Since then, the Old State House has been open to the public as a reminder to Illinoisans of the expensive folly of the early Vandalia citizens. The cornerstone of the State's fifth Capitol was laid at Springfield on July 4, 1837. The principal speaker at the ceremony was Edward D. Baker, a Springfield lawyer and probably Lincoln's most intimate friend. In 1860, Baker was elected the first United States Senator from Oregon and died a Civil War hero in 1861. After repeated delays, the Capitol was finally completed in 1853. The total cost, $260,000, was double the original estimate. The Greek Revival-style building, constructed of stone brought from a quarry only six miles away, was the most imposing state capitol in the west for many years. The building has abundant Lincoln associations. In addition to attending legislative sessions in the building, he sometimes argued cases before the Supreme Court which also met in the Capitol. It was in the Old Capitol that Lincoln first confronted Stephen A. Douglas, his rival for the Presidency in 1860; here Lincoln made his famous "House Divided" speech and maintained an office after election to the Presidency in 1860; and, finally, it was here that his body rested on May 3-4, 1865, before burial at Oak Ridge. 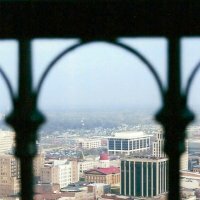 The Old State Capitol as seen from the observation deck atop the dome of the "new" Capitol. 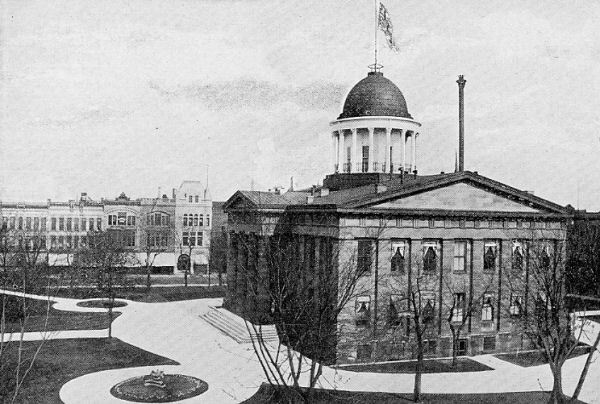 The first Springfield Capitol was sold to Sangamon County in 1869 for some $200,000, and it served as the County Court House for nearly a century. In 1961, the State repurchased the edifice and made plans to restore it to its original appearance. The building was first taken apart stone by stone, each one numbered and carefully stored until reconstruction could begin. After the removal of a ground floor (added in 1899-1901) the building was returned to its proper proportions. The interior decoration and furnishings were meticulously researched to authentically reflect the 1840-60 period. In addition to original space, the building now contains two underground levels which house the offices, vaults and stacks of the Illinois Historical Library. An underground, two-level parking garage has been constructed beneath the lawn. The Old State Capitol, unquestionably one of the most handsome and historic buildings in Illinois, was rededicated on December 3, 1968, as an important part of the State's Sesquicentennial celebration. As Illinois prospered and its population increased, it became apparent that a much larger Capitol was needed. The crowding which occurred during the Civil War expansion of government demonstrated the old Capitol's inadequacies. An enabling act authorizing a new Capitol building was passed by the Twenty-fifth General Assembly on February 24, 1867. This act resulted in the construction of the sixth and final Capitol.